In celebration of the official launch of SillyStyleStudio.com, hitting 2500 (!) followers on Twitter, and to share the fun of my full-time Lego summers, here’s another Tweetaway! Up for giveaway is the Lego Friends Mia’s Lemonade Stand set along with a Lilly Pulitzer inspired Lego necklace (yes, it’s buildable/changeable) designed by yours truly. More examples can be found in the Silly Aunt Jen etsy store. To enter, you must follow @sillyauntjen on twitter and retweet the official contest announcement. A winner will be chosen on June 30th. 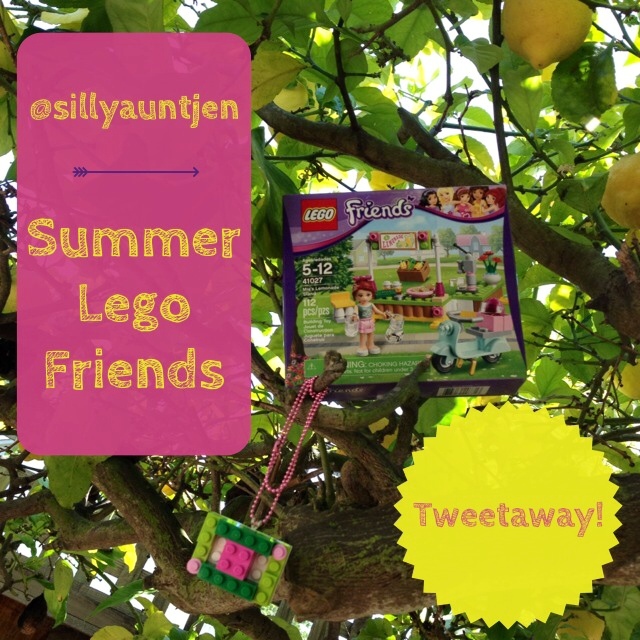 Tags: contest, drawing, free, fun, giveaway, jewelry, Lego, lemonade stand, necklace, social media, style, summer, tweetaway, twitter. Bookmark the permalink. Previous post ← Bouncy Bracelet – Target Hack!